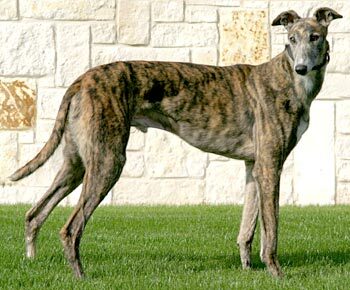 Dusty, aka Flying Dustberry, is a 5-year-old brindle male born December 22, 2003. 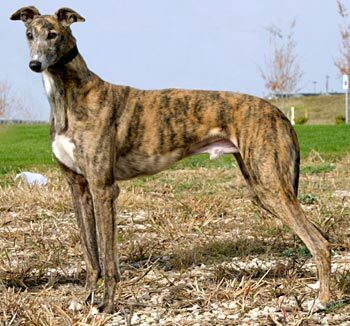 His sire is the famous Gable Dodge, making his grand sire Wigwam Wag, and his dam is Flying Cherry. Dusty was quite the racer with 113 races under his belt - 54 of those races in Grade AA. He raced his whole career in Wheeling, West Virginia, beginning August 31, 2005 and ending August 17, 2007. 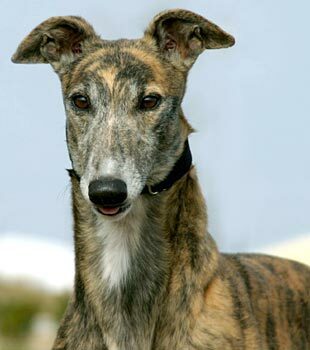 Dusty is a handsome, smaller sized boy who is ready for retirement. No cats for Dusty: Dusty was very interested in Molly and Pepper and would not back off when Molly was swatting his muzzle and hissing at him. He kept searching for where they were. Dusty is not cat trainable. He will be tested with small dogs at a later time. Dusty has a happy, wagging tail! He's quick to say hi to new people, and will lean his head on you while you give him attention. He can be a complete ham – rolling over for belly rubs, and waving his paw at you to say, "More petting, please!" He's learning how to share the attention spotlight with his foster brothers and sisters. Dusty likes to know where his humans are, and will flop down on a convenient dog bed or even on the bare floor so he can keep an eye on you. He's a good boy on leash, but when he sees small furry creatures he'll pull a bit and get very focused on them. We're working on a brisk "'let's go" to continue walking. He likes to have a regular schedule. Dusty is tolerant of being crated especially with a nice treat to work on, but he will very vocally remind you that he's in there when you get home. Durable toys are a must! Fluffy little stuffed animals don't last long because he "loves them to death"' in short order. He's an enthusiastic eater who loves his food and treats. He knows where to wait for his bowl, and he's picking up on other household routines like the smart boy that he is. 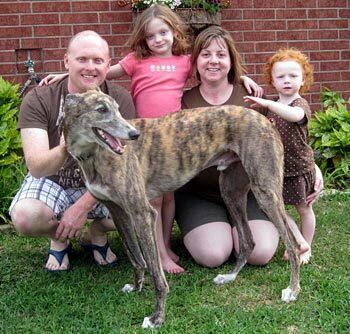 Dusty with his forever family!